The The George R. Brown Convention Center will host the 69th ASHG Annual Meeting. The Convention Center is located at 1001 Avenida De Las Americas, Houston, TX 77010. Telephone: (713) 853-8000. ASHG Program Committee member David Wheeler, from Houston, shares his favorite spots in the city. Houston, Texas offers unique experiences with a lot of culture to ensure an unforgettable trip for every visitor. Whether that means exploring the museum district, dining at award winning restaurants, or exploring the city's countless other attractions, a trip to Houston is whatever you want it to be. 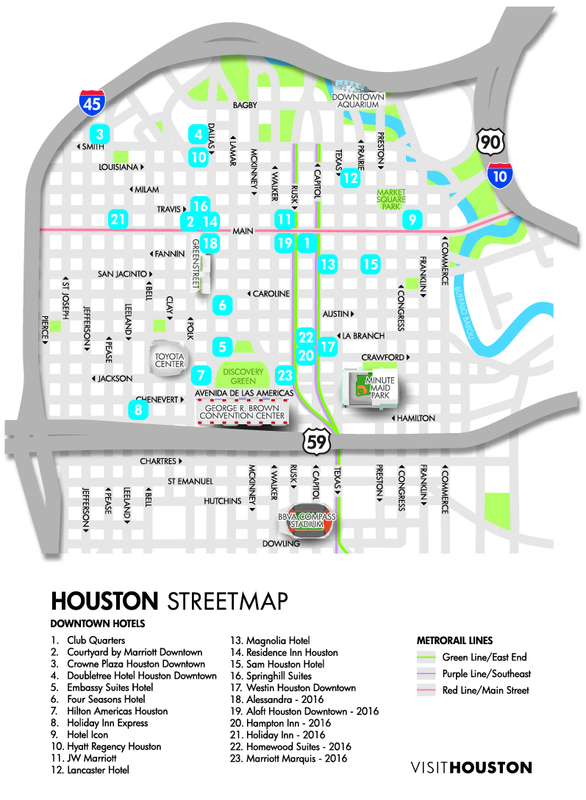 Learn more about the city on the Greater Houston Convention and Visitors Bureau Official Website or download a one-page flyer on Houston's walkable downtown. October Weather in Houston: 82°F average high, 59°F average low. Currency: U.S. dollar, credit cards, and travelers checks are widely accepted. See Currency Converter for details on current exchange rates. Taxes: Sales Tax=7.75%, Hotel Tax=12.5%. The accommodation tax includes hotel transient tax of 10.5% and city hotel district assessment tax of 2.0%. Time Zone: U.S. Central Daylight Time is 5 hours behind Greenwich Mean Time (GMT-5). Houston is the fourth-largest airport system and serves over 180 cities worldwide. The city additionally has the METRORail system, a bus system, and several taxi options. The George R. Brown Convention Center is located in the heart of Downtown Houston, making it well connected to a variety of transportation options. The Houston Airports are William P. Hobby (HOU) Airport and George Bush Intercontinental (IAH) Airport. HOU is located approximately 15 minutes from the Convention Center, and IAH is approximately 25 minutes from the Convention Center. Learn more about airlines, flights, airport services, and security wait times by visiting the website at www.fly2houston.com. Taxis, which operate around the clock, are available by Curb Zone 2 outside the Baggage Claim/Arrivals Level. It's a 15 minute taxi ride to the Convention Center (approximately $27). Ride-sharing services, like Uber and Lyft, can pick up at Curb Zone 5 outside the Baggage Claim/Arrivals Level. Pick-up area is designated by "Ride App" signs. Shuttles can be requested to certain hotels using the phones and Interactive Visitor Kiosks in baggage claim. They pick up by the Baggage Claim/Arrivals Level on Curb Zone 3. Please check the airport website for further details. Shuttle service by off-airport companies is available, and pick up is at Curb Zones 3 and 4. Advance reservations are highly recommended. The METRO bus provides local services from the airport, and bus 40 stops in downtown Houston and at the Convention Center. See the map and schedules for details. Taxis, Are available outside Baggage Claim/Arrivals Level for Terminals A, B, C, and E. Exits are labeled "Taxis." It's a 25 minute taxi ride to the Convention Center (approximately $53). Ride-sharing services, like Uber and Lyft, can pick up at the Baggage/Claim Arrivals Level, outside terminals A, B, C, and E. Pick-up area is designated by "Ride App" signs. Shuttles can be requested to certain hotels using the phones and Interactive Visitor Kiosks in Baggage Claim in Terminals A, B and C, and on the International Arrivals Level of Terminal E. They pick up by the Baggage Claim/Arrivals Level for terminals A, B, and C. Please check the airport website for further details. Shuttle service by off-airport companies is available, and pick up is at Terminals A, B, and C. Advance reservations are highly recommended. The METRO bus provides local services from the airport, and bus 102 stops in downtown Houston. See the map and schedules for details. The Sunset Limited Train runs along Amtrak's Southern-most route from New Orleans, LA to Los Angeles, CA. Greyhound offers bus service from countless U.S. cities and express routes to Austin, Dallas, and San Antonio. Megabus offers daily trips to Dallas/Fort Worth, San Antonio, Austin, New Orleans, Oklahoma City, and others. The George R. Brown Convention Center has compiled information on directions and parking. The Convention Center is located in Downtwon Houston, close to restaurants and several attractions. Taxis, ride-sharing services, METRORail, and METRO bus systems operate extensively throughout the region. METRORail System: The METRORail provides convenient service from the George R. Brown Convention Center to various points downtown including the Museum District, Texas Medical Center, and BBVA Compass Stadium. Bus System: There are several local services that run through Houston, with low fares ranging from $1.25-$4.50. Your abstract submission and meeting registration confirmations will include links to generate a customized letter of invitation. See the Letters of Invitation section below for details. The U.S. Department of Homeland Security’s (DHS) Electronic System for Travel Authorization (ESTA) is a free, automated system used to determine the eligibility of visitors to travel to the United States without a visa, under the Visa Waiver Program. It collects the same information as the paper I-94W form you usually complete en route to the U.S. DHS recommends that travelers submit an ESTA application as soon as they begin travel plans. ESTA applications may be submitted at any time prior to travel. An ESTA authorization generally will be valid for up to two years. Unsure if you need to apply? See frequently asked questions for guidance. ASHG 2019 attendees are encouraged to apply for visas as early as possible – at least 4 to 6 months before the visa is needed. Do not wait until your abstract is accepted to apply. Please check with your local U.S. consulate or embassy to find out the earliest that you may apply for a visa. For further information, visit the State Department website. Restrictions announced in 2017 about travel to the U.S. threaten to have a serious impact on scientific research by blocking the free flow of ideas, collaboration, and findings. ASHG opposes policies that unduly hinder our community in crossing borders, and we believe our meeting and others are critical in moving global research forward and proving the value of an international scientific community. Although the current policies may change, we encourage our non-U.S. attendees to submit an abstract, obtain a letter of invitation, and apply for a visa as soon as possible to ensure the best possible chances of being able to attend. Start early: Register for ASHG 2019 as soon as possible so that your customized letter of invitation can be generated. Provide proof of scientific status (e.g., proof that you submitted an abstract for the meeting). Do not wait until you receive notification that your abstract submission has been accepted before applying for a visa. It is rare that ASHG denies an abstract. If your abstract presents new information and follows the rules and guidelines, it will most likely be accepted and programmed. If your visa has not received approval at least two weeks prior to the start date of the Annual Meeting, you should complete the Visa online questionnaire. Eligibility requirements are listed before you begin. Please note that individuals who have applied for dependent visas (such as F2 and J2) should not complete this questionnaire. Some foreign meeting participants may not need visas if they are citizens of any of the 38 countries on the Visa Waiver Program. As of April 1, 2016, you must have an e-Passport to use the VWP. Without an e-Passport, you will be required to apply for a visa. All foreign visitors (including VWP travelers) will be fingerprinted and photographed upon arrival in the U.S.
You will need this letter when applying for a visa. All attendees are urged to apply for a visa as soon as possible. Waiting until you receive your abstract confirmation (which is not available until August) will delay your visa process and may result in your visa being denied.